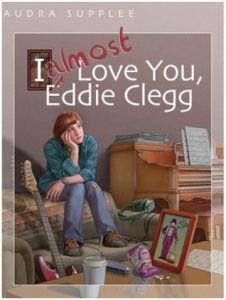 I Almost Love You, Eddie Clegg – Peachtree Publishing Company Inc.
Little white lies don’t hurt anyone…right? For thirteen-year-old Asa Marie (a.k.a. Ace), life both inside and outside of middle school has suddenly gotten a lot more complicated. At school, being popular demands keeping up with the latest “fads” set by a girl named Jennifer. Unfortunately, Asa doesn’t have the money―or the inside scoop―to keep up with them. At home, her musician stepfather Eddie, a recovering alcoholic, can be sweet, funny, and even…well, useful to Asa when she needs something. But after nearly eight years of living in the same house with Eddie, Asa still thinks of him as her mother’s husband, not a father. Then Eddie loses his job when the local orchestra is disbanded―and he begins drinking again. Now Asa’s life is a mess. At school, she struggles to find her way through the social mine field, juggling her comically-high social aspirations as well as a budding romance with Domino, the boy next door. Meanwhile, on the home front, she battles to keep her family together by covering for Eddie. Soon Asa is telling so many “little white lies” that she has trouble remembering exactly what, in fact, is true. But Asa discovers one very important truth: hers and Eddie’s deceptions are not helping any of them. Not her mom, not herself, and especially not Eddie. Asa finally decides to stand on her own two feet―and makes some very tough decisions to try to save her family. Audra Supplee is the author of the young adult novels I Almost Love You, Eddie Clegg and Standing Ovation(published under her maiden name Audra Spotts). She received an undergraduate degree in English and Literature from West Chester University and lives in Pennsylvania. You can visit her website here.